České Budějovice (Budweis in German) is the capital of South Bohemia. It is the home to the Budweiser Budvar brewery. It is also a university town so they are used to having a lot of active people around. The same river, the Vltava, that crosses under the Charles River bridge in Prague runs through České Budějovice. You can rent a boat for an easy outing on the river past parks that hold summer concerts and film series. European Bike route 7 runs right along the Vltava river in the middle of town. You can bike it out into the country side, or if you get ambitious you can bike it all the way to Prague or if you get very very ambitious, you can bike it all the way to Nordkap at the northern tip of Norway or down to the toe of the Italian peninsula. This bike route connects to the total of 5000 km of bike paths in South Bohemia alone. We stayed in the lovely Hotel Budweis right along the river and in seay walking distance to the center of town. Hluboká nad Vltavou is a small town with a city square with restaurants with outdoor seating and a microbrewery, but it is best known for its castle. You can play a round of golf or just hit a bucket of balls at the Hluboká Golf Club with a view of the beautiful town of Hluboká nad Vltavou and the Hluboká castle. At home, not even Pebble Beach has a castle. At the nearby Hluboká Sports and Recreation complex you can challenge yourself with the high ropes course, zip down the zipline, play volleyball or baseball (who thought you would see that in the Czech Republic) or rent a scooter or electric bike to get out on the bike paths. This is a facility that the whole family can enjoy as there are also kids play areas. 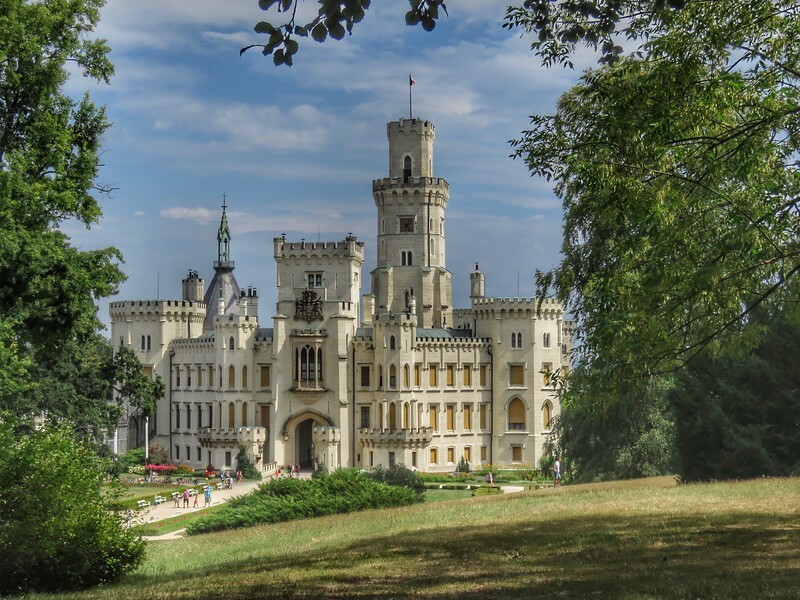 When you are done at the sports complex take a hike to the top of the hill to see Hluboká castle. We stayed at the nearby and absolutely gorgeous Castle Mitrowicz. If you are planning a destination wedding for South Bohemia, this is where you want to have it. This newly renovated chateau includes a chapel which the bridal suite overlooks. Český Krumlov is the second most visited city in the Czech Republic after Prague. It’s castle is located high on a hill in the middle of the winding Vltava river. From my first view of the castle I fell in love with this city. 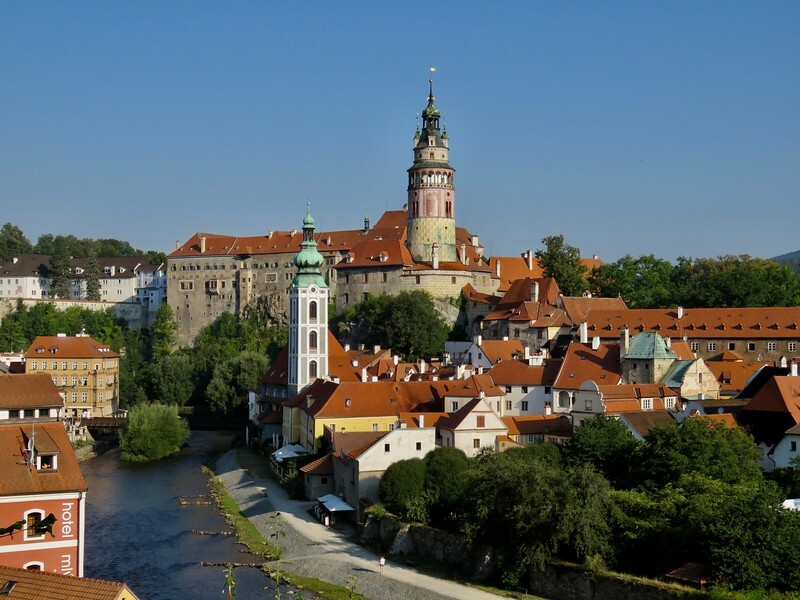 The beautiful town of Český Krumlov is built on hills so a simple walking tour of the town will get you some good exercise as well as a better understanding of this UNESCO World Heritage city. 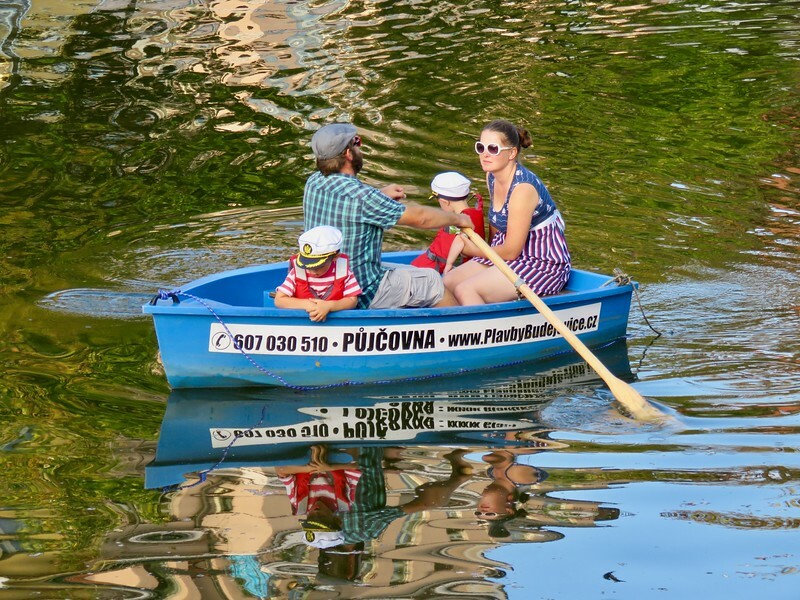 But what the locals do in Český Krumlov is enjoy the Vltava river which bisects the town. While hordes of Chinese tourists day trip here in buses the Czech visitors can be seen camping along the shores of the river upstream from the city and floating down into town on rafts and canoes. Frankly the locals seem to be having a much better time. Outfitters can rent you a 6 person raft and transport you up the river to the town of Vyšší Brod from where you can start your journey. We stayed at the Hotel Latrán which is in the historic city center right near the red gate to the castle. You can’t get any more convenient that this. It used to be that winter was the high season for the resort at the end of Lake Lipno but this area is now filled with family oriented outdoor activities in the summer as well. 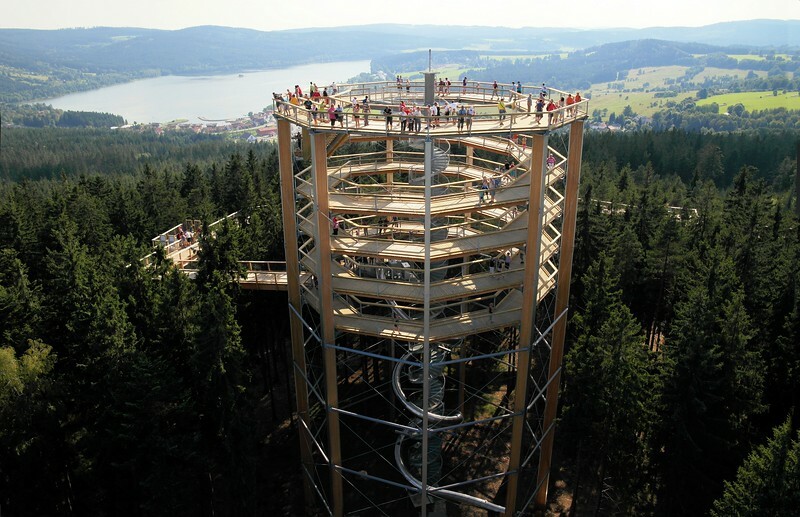 In the Winter Lake Lipno has a modern ski resort with 3 chair lifts and 11.8 km of slopes. 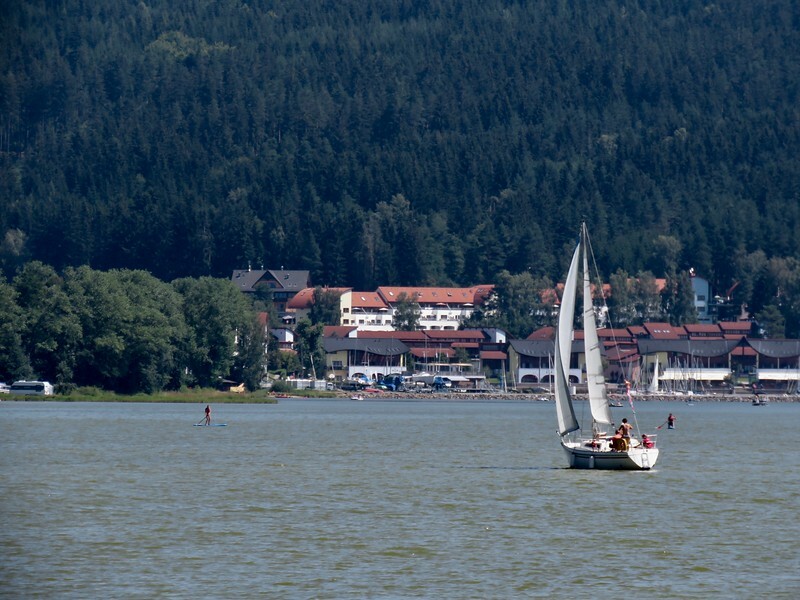 Lake Lipno, near the Czech border with Austria is the largest lake in the Czech Republic and it is filled with watercraft, especially sail boats. You can also cross the length of the lake by ferry. The chair lifts continue to run during the day in the summer and you can ride them up the mountain to visit the treetop walkway and observation tower with a commanding view of the lake and the valley below. The tower is built with families in mind with all sorts of things for kids to explore and learn on the hike up to the top of the tower. 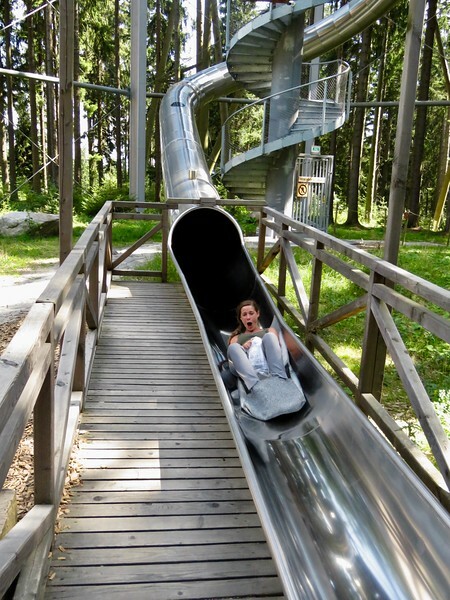 If you are game, you can slide down a bumpy metal slide to get back down to the ground quickly. I did it! You can hike down on well marked trails. Of course you can also hike up if you so desire. You can rent a mountain bike and bike down the mountain. You can do what I did and rent a scooter to take the journey down the mountain. It was fun to do, although half the time I only felt somewhat in control. I managed not to wipe out, but it always seemed like I was close to going over the handle bars because my center of gravity was much higher than on a bike. We stayed at the Amenity Hotel Lipno right along the shore of the lake. The hotel was beautifully located with a great restaurant with outdoor dining. 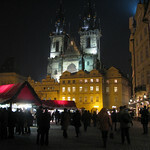 I have visited the Czech Republic in the winter and it was cold. It seems like because of that its residents make the most of their beautiful summer days by spending them outside. You should too! Some fun activities! I would love to do the slide!